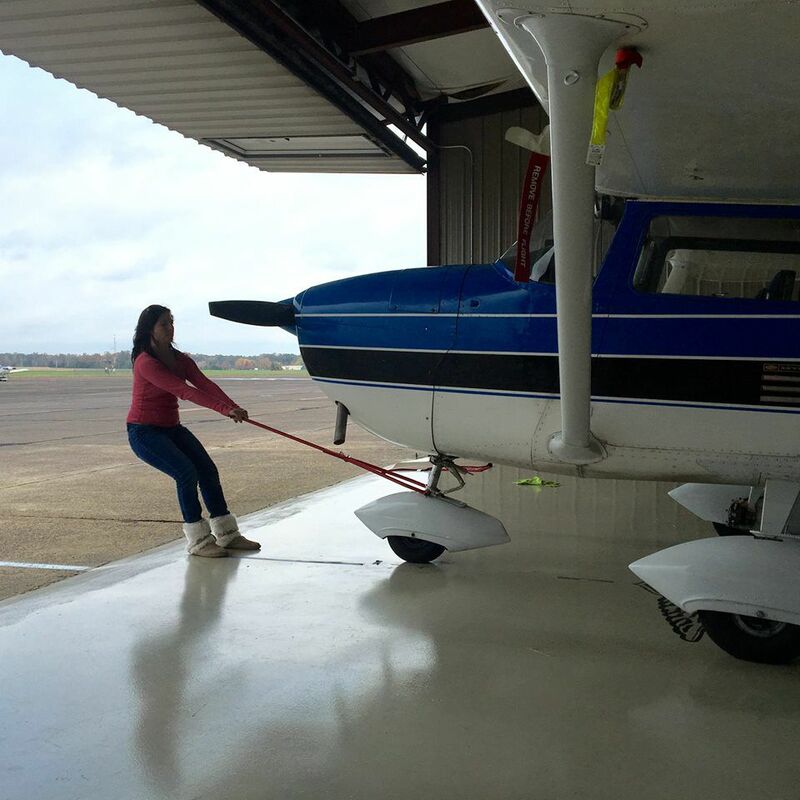 After struggling with addiction for years, Lauren Havens has transformed her life and is now on her way of becoming a pilot, thanks to the support she found at Blue Monarch and the help of Tullahoma resident Jim Apple. Lauren Havens takes a flight lesson at the Tullahoma Municipal Airport. Lauren Havens takes a flight lesson with certified flight instructor Maj. Gen. (Ret) John Miller at the Tullahoma Municipal Airport. Lauren Havens, 32, struggled with addiction for years and, as a child, “never felt really smart or capable of much.” She is now on her way of becoming a pilot, thanks to the support she found at Blue Monarch and the help of Tullahoma resident Jim Apple. Havens, who was born and raised in Alabama, moved with her family to Tennessee when she was 13. “I come from a really good family,” Havens said. When she was about 17, her parents’ relationships deteriorated and they divorced. “I moved out, and from there, I picked up addiction,” Havens said. She first sought out the help of Blue Monarch when she was 25, but then she “was not serious about the program,” said Havens. “I came trying to get my daughter back and to stay out of trouble – I had three probation officers out of three different counties – so it was a way to get out of jail for me,” Havens said. She “messed up” and Blue Monarch had to discharge her. But she took what she had learned with her, and after she left the organization, Havens stayed sober for four years. However, she ended up relapsing and finding herself in the vicious circle of addiction again. She is thankful that Susan Binkley, founder of Blue Monarch, gave her another chance, and 15 months ago, Havens joined the program again. Havens has two children – an 11-year-old girl, Cadence, and a 5-year-old boy, Jonah. Since they moved to Blue Monarch, their relationship has improved. Jonah loves being at Blue Monarch, too. “He is such a good boy – so sweet,” Havens said. While Jonah loves his mother unconditionally, there is one thing about her he’s most proud of: she can fly an airplane. The idea was born during a work ethics class Binkley taught at Blue Monarch. Shortly after that conversation, Binkley invited Tullahoma resident Jim Apple, a pilot who owns an airplane, to meet Havens. “Susan invited him to come and talk with me about aviation, and he didn’t expect me to be so focused,” Havens said. When Apple saw Havens’ excitement and desire to learn more, he wanted to help. He had an offer for Havens: he would let her use his plane – a Cessna 172 Skyhawk – and pay for other expenses, including fuel and ground school, so she could obtain a private pilot certificate. Earning a private pilot license requires approximately 40 hours of flight time, according to the Federal Aviation Administration (FAA). “That’s a big deal,” Havens said. “If you would do it without someone helping you, it could be up to $10,000 just to get a private license,” she said. Becoming a private pilot is the first step toward Havens’ goal of obtaining a commercial license, which will allow her to have a job in aviation. “You have to get your private license before you can get a commercial license and make a career out of it,” Havens said. She has already taken several flight lessons at the Tullahoma Regional Airport. The lessons were interesting, and being in the air was “a little scary” but thrilling, said Havens. One of the most exciting moments for Havens was flying over Blue Monarch, where her dream of becoming a pilot was born. Binkley has witnessed Havens’ transformation with joy. It has been very touching to see how the community at Blue Monarch has shared Havens’ excitement, Binkley said. It has been a great pleasure to watch Havens’ positive transformation, she said. Apple and his wife, MaryLou, have been interested in Blue Monarch for several years, said Apple. When Binkley called him and told him about Havens’ interest, he wanted to learn more. He was impressed, but still needed to be convinced she was the “real deal,” said Apple. So he invited Havens and Binkley to the airport and took them for a plane ride. During this flight, after they were “leveled-out,” he offered the controls to Havens, and she flew the plane for 10 minutes “as calmly and smoothly as I’d ever seen a non-pilot do,” said Apple. “I was convinced then she was the real deal,” he said. Later that day, he called his friend Maj. Gen. (Ret) John Miller, who is a certified flight instructor. “I told John about Lauren, how impressed I was with her and asked him to meet her,” Apple said. He was so impressed that he agreed to donate his time to give Havens flying lessons at no cost. Apple said he’s excited to have the opportunity to help Havens. “She’s dedicated, determined and deserves it,” Apple said. “I consider this one of the best investments I’ve ever made. I am only 25 percent of this equation,” Apple said. “Gen. Miller is at least another 25 percent by providing the instruction. But the real ‘investor’ here is Lauren. Through this experience, Havens has learned she is smart and capable.